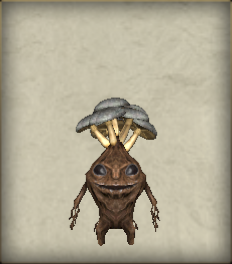 A Mandragora with a cluster of mushrooms with infected spores. The mandragora's head is a common bacteria hotbed. There are special cultivation techniques used in order to make successful clusters of good mushrooms, which requires a great amount of other fungi and the right humidity.